Well, it’s been a year since I last had a Lovecraft binge (see Parts 1, 2, and 3 for my previous binges). And while I didn’t read any actual Lovecraft stories in the year (holy cow, that long?) since my last binge, he was certainly never far from my mind. I read a lot of fiction influenced or modeled after his work, including the Lovecraft/YA novel Awoken* (read my review here), shopped around my own Lovecraft-themed story The Red Bursts (still working on that), and wrote an article about why there’s not more adaptations or even a cinematic universe based on his work. No, surprise, after all that I was ready for another dive into his work. And boy, did I enjoy the eldritch swim. 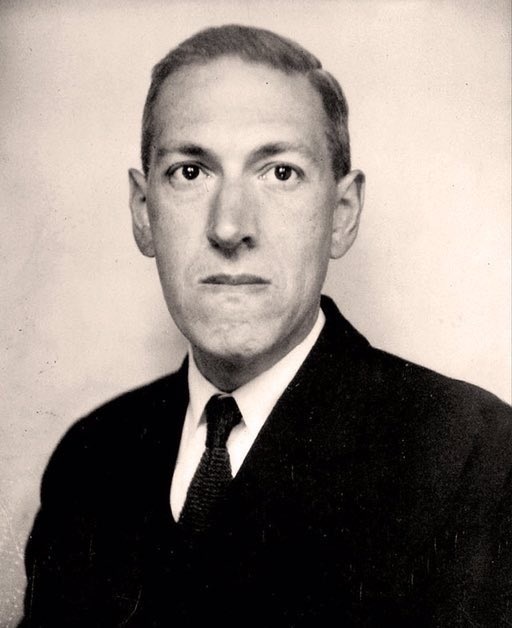 So if you’re not familiar with HP Lovecraft (and I’d bet good money that you’re not), he was an early 20th-century author whose ideas and stories proved very influential on storytellers like Stephen King, Guillermo del Toro, and Allan Moore, among others. He’s considered the father of cosmic horror, the idea that humans are basically ants in our universe, that there are beings and truths so great and terrible that even glimpsing them can cause madness and death. It’s pretty bleak stuff, if you think about too much about it (which I have). So this time around, I read “The Case of Charles Dexter Ward,” Lovecraft’s only finished novel, “The Colour Out of Space,” “The Dunwich Horror,” “History of the Neconomicon” and “The Whisperer in Darkness,” as well as several fragments, one letter excerpt, and one parody story, but I won’t go over those. And I got to say, these were definitely some of the most enjoyable of Lovecraft’s stories. They were consistently creepy and kept me engrossed in the story, as well as with the most accessible language (dude liked to pretend he was a contemporary of Poe, rather than a contemporary of Ernest Hemingway). Or am I just used to his style now? The interesting thing about these highlighted stories is, they also mark Lovecraft’s shift from pure horror to science-horror. Sure, he’s done that before–“Herbert West: Reanimator” is the story of two men trying to discover the key to bringing back the dead using science, a theme also explored in “Charles Dexter Ward,” but more thriller and magical than science-fiction–but here there was definitely a more sci-fi element in his work. “The Colour Out of Space” and “The Whisperer in Darkness” both involved aliens, with the former involving a sort of alien infection and the latter involving aliens that have been visiting Earth for centuries. Why did Lovecraft make this shift? Well, around the time these stories were written–late 1920’s and early 1930’s–was also the birth of science fiction as a proper genre. Pulp magazines like Amazing Stories and Astounding Stories were huge sellers, and since pulp rags like these were where Lovecraft normally published his work, he would’ve been aware of the young genre and its exploration of humanity’s possibilities through space exploration, technology, and aliens. It’s no surprise that he’d take elements from those stories and give them a freaky twist. And lo and behold, it led to Lovecraft writing some of my favorite works by him (especially “Colour Out of Space.” God, that was freaky, considering that what happened in that story could maybe happen in real life). Honestly, I’m glad I decided to check out HP Lovecraft two-and-a-half years ago. Sure, his early works can be hit-and-miss, but as time went on, he got better. And by this point in his bibliography, he was very good at writing stories that stayed in your mind. It’s a shame he didn’t achieve more of a following during this time, because maybe then we’d have more works by him (sadly, he died in 1937 at barely forty years of age), and he’d be more well-known today. And while I’m done with my latest binge, I’m looking forward to my next one, whenever that is. Especially if the stories from this point on are as good as the ones I read this time around. And seeing as At the Mountain of Madness is the next story in my collection, I’d say that’s a definite possibility. Have you read these stories or others by Lovecraft? What are your thoughts on them? *Funny story about Awoken: so I follow this woman named Lindsay Ellis on YouTube (check out her channel here) who does a lot of videos on our media and culture. Yesterday she uploaded a video about whether or not the hate over the Twilight franchise was warranted. During said video, she mentions she and friend/frequent collaborator Antonella “Nella” Inserra wrote Awoken as a parody of Twilight, only with Lovecraft characters instead of vampires. My mouth hit the floor. I had no idea that the novel was a parody of Twilight, let alone written by those two women under a pen name. Though now that I think about it, it explains quite a bit. I reached out to both women on YouTube and Twitter, letting them know that I read the novel, my ignorance of its authorship, how much I actually liked it, and that I reviewed it on this blog. They asked for a link, and I sent it to them. Since then, I’ve gotten hundreds of views from their readers/viewers on that one review, and the number of reads is still growing. Wow. Didn’t expect that. Pretty cool. Probably won’t last a week, but it’s still cool. Also, I learned about Poe’s Rule: if you write a parody of something, unless you ad a healthy dose of comedy, people will think it’s serious fiction in a particular style. Which is apparently what happened to me, as these readers are telling me. Good to know. Rose: The Fourth Draft is Finished!! !